Refrigerated cabinet Kvarts Compact in the shop «MUCHO GUSTO». Sapfir in the supermarket "Gourmet"
has been launched for manufacturing, along with general style concept of “MAGMA” retail refrigeration equipment. A Catalogue of MAGMA retail refrigeration equipment has been updated. Transparent sliding doors for Islands and Wall cabinets reduce loss of cold allowing, in turn, to reduce the need for cold output up to 40% and save up to 50% of energy consumption. Internal temperature remains stable nonetheless of external changes for temperature, humidity, lighting and other factors such as draft, rain and different seasons. In case of temporary power blackout, sliding doors significantly restrain loss of cold thus preserving frozen food even longer. The glass avoids penetration of humid air inside the unit, excluding formation of frazil, frost and condensation on food and parts of the Display case. 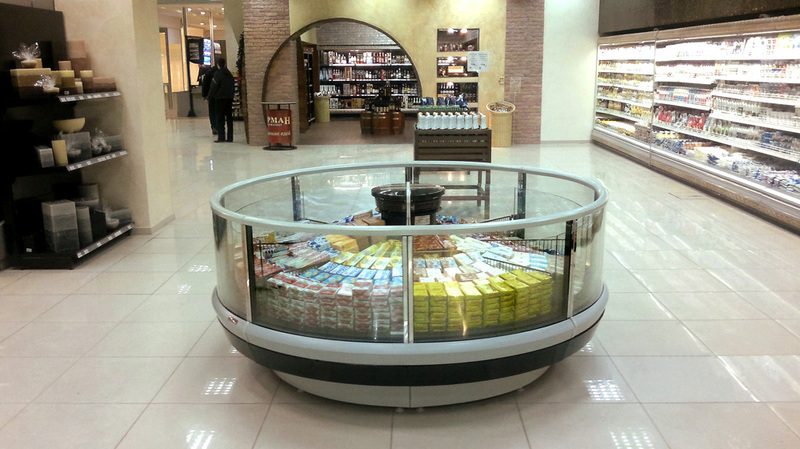 Sliding doors can be easily mounted on display cases already in the supermarket. Each year the Company participates at international exhibitions, demonstrating both MAGMA retail “dry” equipment and refrigerated equipment. For the ShopDesign exhibition, besides exclusive models of refrigerated equipment and retail furniture, a brand new model for Checkout counter has been presented. For its appearance a unique style concept of MAGMA retail refrigerated equipment has been chosen. Checkout counter is made out of the metal with polymer coatings. The feet are produced from the polished stainless steel. Special textured stainless steel was selected to cover the work surface. The bumper and corner elements of the table are made out of shockproof plastic. Large size of the goods holder contributes to the fast and convenient service for the customers. Checkout counter is made out of the metal with polymer coatings. Special textured stainless steel was selected to cover the work surface. The bumper and corner elements of the table are made out of shockproof plastic. Large size of the goods holder contributes to the fast and convenient service for the customers. Checkout counters of general purpose. The counter can be manufactured for the left-hand as well as for the right-hand operations. Checkout counter is made out of the metal with polymer coatings. Special polished stainless steel covers the work surface. Large size of the goods holder contributes to the fast and convenient service for the customers. MAGMA - it is just one commercial refrigeration equipment manufacturer, that has a wide spectrum of commercial refrigeration equipment in the assortment, besides that retail equipment, checkout counters and accessories for checkout modules, additional equipment for checkout system are produced.